Cameron spends his days obsessing over every aspect of Showbie. On his own time he is concerned mainly with furniture, records, synthesizers, bikes, beer, and cats. Still the reigning ping-pong champion at Showbie HQ. Showbie has been in need of a fresh coat of paint ever since iOS7 was released last fall. We finally took the plunge and overhauled the whole app to be cleaner, brighter and friendlier than before. We’ve added new visual indicators to classes, assignments, and student folders. In addition to the feedback and paperclip icons, you will now see a blue highlight if changes have occurred since the last time you viewed the item. Now it’s easy to see at a glance which students have revised their work or asked you a question, across all of your classes and assignments. We’ve replaced the strange glowing microphone with a fun, analog-style volume meter, which will give you a more responsive and accurate indication of your recording level. 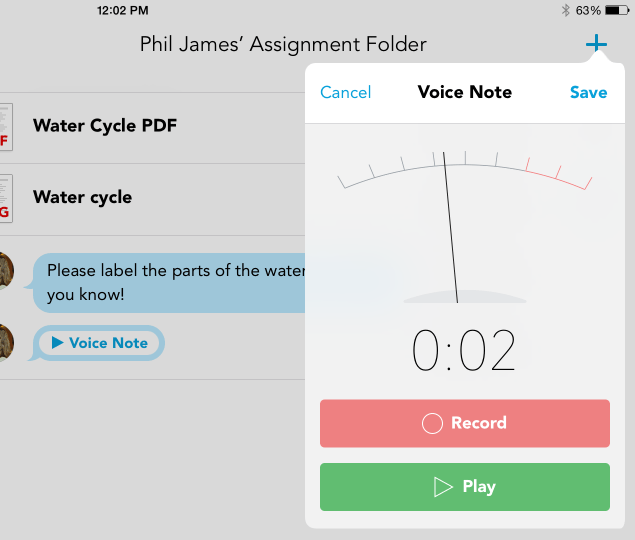 When you listen to voice notes, you can now drag the playhead indicator to skip forward or backward in the recording. Video recording size has been increased to 5 minutes per clip for Pro users! 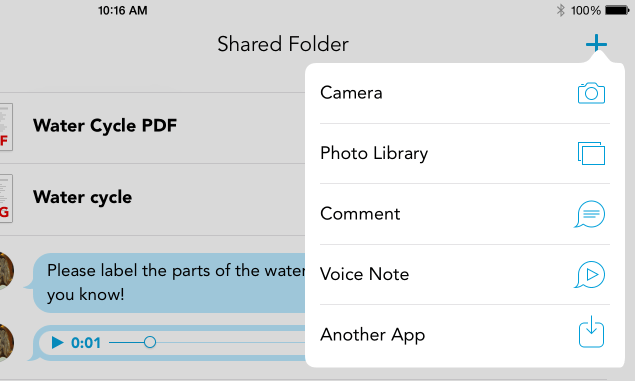 Don’t worry about choosing between Camera and Capture PDF when you create a new file in Showbie. You can now add Showbie annotations to any image file, in addition to PDF. When you’re viewing an image in Showbie, you can choose ‘Open In…’ which will export as a PDF, or ‘Save Image’ which will save the original image file to your camera roll. 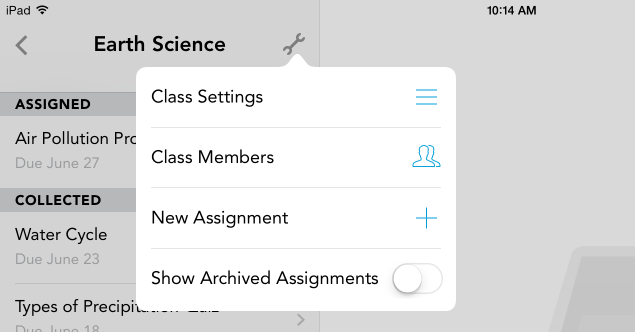 Class and assignment settings can now be accessed directly from the settings menu inside the class or assignment. It is no longer necessary to enter ‘Edit Mode’ before choosing the class/assignment you want to edit. In the Class Members list, you can now view a full user profile for each member, with straightforward controls to reset passwords, approve pending members, or block members. In addition to these improvements, version 1.3 lays the groundwork for improvements and features that we plan to roll out in the coming months. As always, we love to hear your thoughts on the app and your ideas for future improvements. Follow us on twitter or head over to our support forum to sound off! Showbie Meets Project Pupil Podcast!